Have you heard of Secret Squirrel? 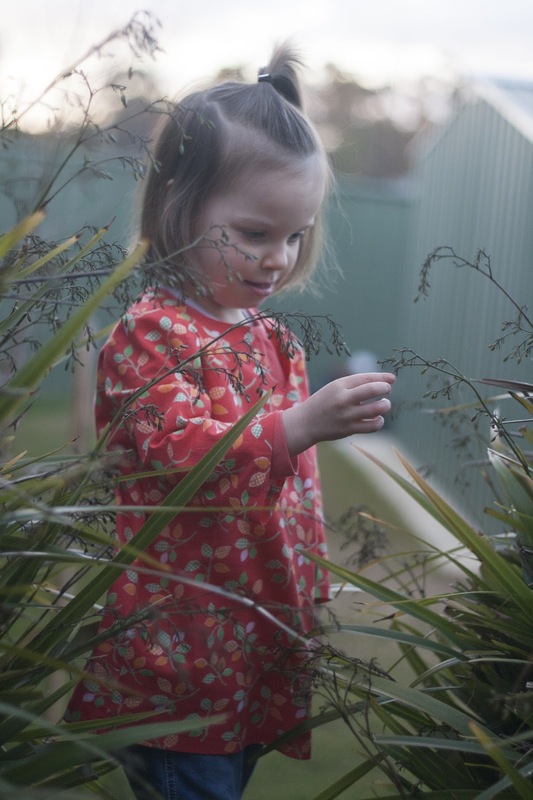 It is the brainchild of Suz from Sewpony and An from Straightgrain. In the nutshell, it is a sewing challenge. Secret Squirrel is going to travel the blogging world all year long (lucky thing!) delivering acorns of sewing inspiration. Those willing to accept a challenge need to create an outfit for their child based on acorns of inspiration passed on to them by previous bloggers who have met and conquered his missions. This idea sounded so fun I had to jump on board! So what five acorns has Secret Squirrel left in August? 1 - Tangerine. 2 -Patch. 3 - Anne of Green Gables. 4 - Australia. 5 - Something old. So, While she was sleeping, I accepted Secret Squirrel's challenge and created a new outfit for my Little Monkey. What do you think? As soon as I red that one of the acorns was 'tangerine' I thought of this gorgeous fabric. Don't you love the colour? This fabric was left from my grandma, so I could cross 'something old' off the list too. I am not sure just how old this fabric is. Grandma could have bought it when I was little or even when my mum was a baby. I will have to ask mum next time I chat with her. I used Sophia Tunic pattern by Sew Sweet Patterns. I made the tunic shorter and the sleeves longer. The tunic is a tiny bit too big, but it should fit Little Monkey just right when it finally gets warmer. It is still wooly jumper weather in my corner of the world. My Little Monkey is really enjoying pockets at the moment. She will pick an old worn out item that has pockets over something cute without them. Go figure! In this case my daughter's newest craze corresponded with one of Secret Squirrel's acorns - 'patch'. I added a patch pocket. 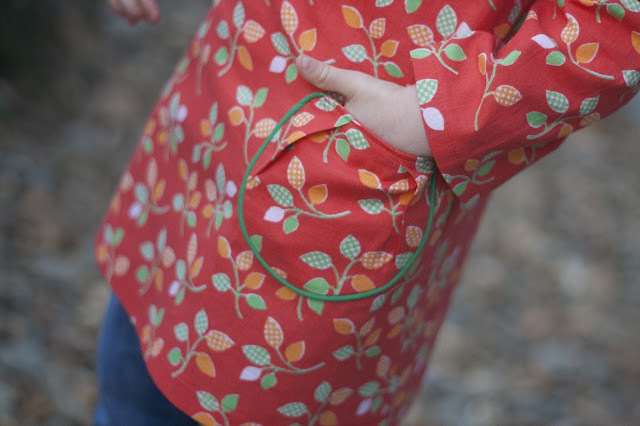 I didn't want a plain pocket, but I was not sure if making something 'out there' would suit a simple style of the tunic. I cut out a wide rounded pocket and kept on folding fabric this way and that until I was happy with the way it looked. I had to use piping to help it stand out. Besides, piping is my newest craze and I felt the urge to satisfy it. The third acorn of inspiration was 'Anne of Green Gables'. I don't really know anything about Anne of Green Gables, so I googled it. No, it is not cheating! I learned that the Cuthberts wanted a boy, not a girl. Boy... Boy... Pants! Of course! OK, here is the cheating bit. I originally wanted to make a new pair of pants for Little Monkey but then decided to jazz up an old pair of jeans instead. I unpicked the plain (and therefore boring) back pockets and replaced them with 'patch' pockets made from the same fabric as the tunic. Take that Secret Squirrel! The last acorn was 'Australia'. Where do I start! I love Australia. It is my home. I feel happy here. I cannot imagine living anywhere else. I could have gone with some classic Aussie symbol like a kangaroo, koala, emu or platypus (living proof that God has a sense of humour). Or maybe some Aboriginal symbol. However I thought that would have been too obvious. 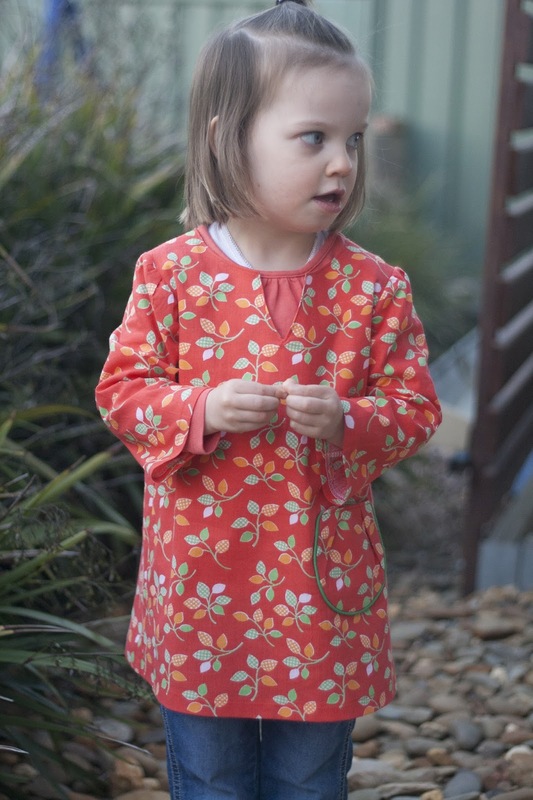 Instead I cut a tag off one of my towels and sewed it onto Little Monkey's new tunic. So there you go. 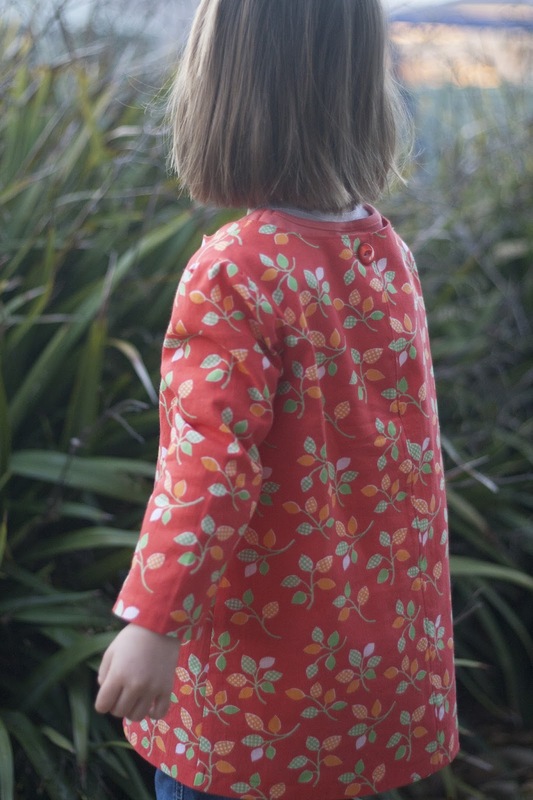 Five acorns of inspiration, one (and a bit) new outfit for my Little Monkey. Will you accept Secret Squirrel's challenge? Absolutely gorgeous, love everything about it. You did a fabulous job on the pocket, really makes the outfit. Really cute! I'd say you nailed it with that challenge :) The patch pockets are my favorite, and LOVE the piping on them!! GORGEOUS JENYA!!!!! I totally love this outfit. How special to use your Grandma's fabric. I love love it. top and pants - they are so cool!!! thanks for sewing along!! A beautiful outfit, Jenya!!! Very clever to incorporate all the acorns. I love the pockets, both on the tunic and the jeans and you know I adore piping. That last photo is lovely. That sounds like such a fun blog series.I really like that vintage fabric. Is it from the seventies? I was just looking at that Sew Sweet pattern the other day. Thanks for the review. this is the Second time I see this pattern and it is really lovely. And your fabric!!! . You're brave, I don't know if I can cut a fabric saved for so much time. Thank you for explain about the challenge, I didn't understand the first time I read about it. Your (Grand-mom) fabric is stunning! I really love it and how you turn it to be a cute+wearable outfits.Wonderful job! I love your interpretation of the acorns - and you've created something stylish and comfy. Well done! Love this outfit! 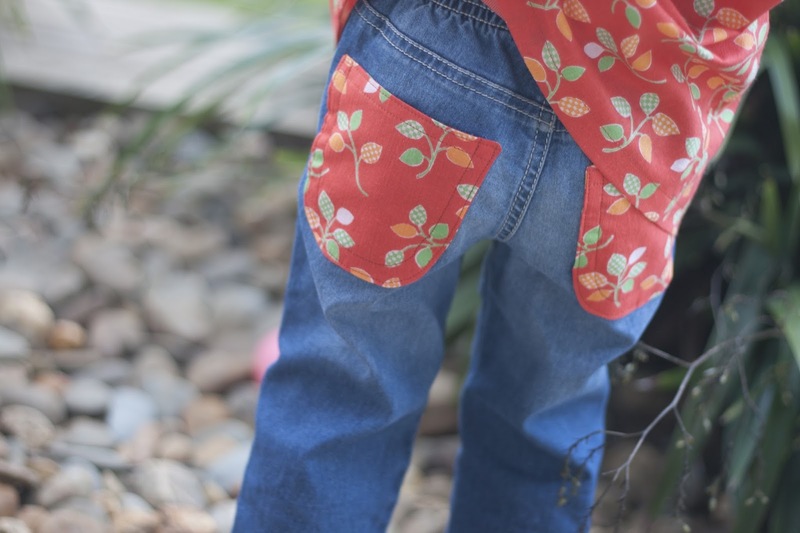 Patch pocket is my favorite..:) And vintage fabric looks so gorgeous!